In September, McLaren unveiled the P1, featuring a carbon fibre monocoque and roof structure safety cage concept called MonoCage, a development of the MonoCell used in the 12C and 12C Spider. All the P1's body panels are carbon fibre composite. According to the Frost & Sullivan report Supply Chain Analysis of the Automotive Carbon Fiber Composites Market, the automotive carbon fibre composites market is likely to grow to US$95.5 million by 2017 at a compound annual growth rate (CAGR) of 30.6%. The market saw revenues of $14.7 million in 2010. The report states that fuel efficiency and low carbon emission regulations are playing a major role in raising demand for lightweight automotive composite components to replace metal parts. Carbon composites are also being widely adopted in alternative vehicles such as electric/hybrid and fuel cell vehicles (see Electric cars need lightweight composites). However, Frost & Sullivan notes that barriers to growth include the high cost of carbon fibre and existing production techniques that result in higher manufacturing cycle times (and low-volume production), and concerns over providing a waste disposal/recycling system for carbon composite parts. There is also a lack of general engineering experience among OEMs that are reluctant to move away from the metal-based assembly lines, which they have already heavily invested in, it says. 2012 saw numerous developments and collaborations in the automotive composites sector. Here are 10 key ones (in chronological order). In April, Ford and Dow Automotive Systems signed a joint development agreement to research the use of carbon fibre composites in high-volume vehicles. Cutting the weight of new cars by up to 750 lbs by the end of the decade is key to Ford's strategy to improve fuel efficiency. (See Ford and Dow team up on low cost, high volume carbon fibre composites.) A couple of months later Dow announced plans to form a joint venture with Turkish company AKSA to manufacture carbon fibre. Showing that glass fibre is still very much in the mix, in July SABIC Innovative Plastics announced that it was "significantly boosting" capacity for its STAMAX long glass fibre reinforced polypropylene composite to meet growing demand from automotive customers. The new production line is scheduled to start up in the second half of 2013. (See SABIC increases STAMAX thermoplastic composite capacity to meet automotive demand.) STAMAX is used in front-end modules, door modules, and seating and tailgate structures. In August, Cytec, an established supplier of advanced composite materials to the aerospace sector, announced a collaboration with UK headquartered Jaguar Land Rover, part of India's Tata Motors, to develop designs, materials and manufacturing concepts for the cost-effective use of composites materials in automotive structures. (See Cytec collaborates with Jaguar Land Rover to develop automotive composites.) In this venture Cytec will leverage the expertise of its recent acquisition Umeco, which has more than 30 years’ experience in the manufacture of prepregs for the automotive sector. In October, chemical company BASF and TenCate Advanced Composites announced a strategic alliance to cooperate on the development, production and commercialisation of thermoplastic composite materials suitable for high-volume vehicle production. (See BASF and TenCate team up on automotive thermoplastic composites.) TenCate is one of the founding partners of the newly-established European Thermoplastic Automotive Composites consortium, which aims to promote the use of thermoplastic composites in the automotive sector. In the same month, Ford announced it had developed a prototype carbon fibre composite bonnet for the Ford Focus which weighs more than 50% less than a standard steel version. Production times are also significantly reduced. (See Ford develops prototype carbon composite bonnet.) The carbon bonnet is a sandwich construction comprising a foam core material between two layers of carbon fibre reinforced plastic and was developed as part of the Hightech.NRW research project. Also in October, BASF and the SGL Group announced plans to develop a composite material based on carbon fibre and a reactive polyamide system and intended for the mass production of automotive components. (See BASF and SGL to develop carbon fibre thermoplastics for automotive applications.) The composite is intended for use in the thermoplastic resin transfer moulding RTM) process as well as the reactive injection moulding process. This will permit considerably shorter processing cycles than the conventional thermosetting RTM process, the companies say. In November, in a further step to increase its composites expertise, automotive supplier Faurecia signed a framework agreement with German research institute Fraunhofer ICT concerning the joint R&D of industrial processes for composites for automotive applications. (See Faurecia and Fraunhofer ICT research industrial processes for automotive composites.) In July, Faurecia acquired Sora Composites's automotive business, which produces both carbon and glass fibre composite parts. In December, carbon fibre manufacturer Teijin announced the start up of its pilot plant in Japan for carbon fibre thermoplastic automotive parts. This uses Teijin’s proprietary manufacturing technology which is reported to reduce cycle times required for moulding composite parts to less than 1 minute. (See Teijin establishes mass production technologies for carbon fibre composite.) In December 2011, Teijn and General Motors (GM) announced plans to co-develop carbon fibre composite technologies for potential use in high-volume GM vehicles. The following automotive articles were the most read on our website in 2012. Rebounding automotive industry is welcome news for FRP sector. In April, BMW unveiled a third i brand model – the BMW i8 Spyder two-seat sports car. This features a carbon fibre reinforced plastics passenger cell like the i3 and i8 models. Like the i8 coupe, the i8 Spyder is a plug-in hybrid vehicle. In June, Aston Martin unveiled its new luxury sports car – the Vanquish – which features carbon fibre body panels. First deliveries of the £189,995 car are expected to begin in Europe late in 2012. General Motors introduced its seventh generation Chevrolet Corvette at the North American International Auto Show (NIAS) in Detroit in January 2013. The vehicle features a carbon fibre composite hood and removable roof panels. Read more here. Chrysler's 2013 SRT Viper® supercar was named the 2012 Vehicle Engineering Team Award winner by the Automotive Division of the Society of Plastics Engineers (SPE) in November. The car features carbon composite body panels. The Class A hood assembly is reported to be the largest Class A carbon composite part provided to a mainstream OEM at volumes of up to 3000 vehicle sets/year. It was produced by vacuum bag/autoclave cure.McLaren Automotive launched its 12C Spider sports car in July, 12 months since its MP4-12C model went on sale. Both cars are based on McLaren's one-piece Monocell carbon composite chassis. 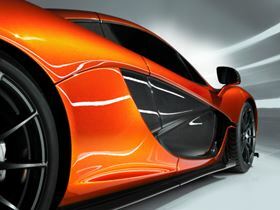 In September, the company introduced the McLaren P1 'supercar', that features a carbon fibre monocoque and roof structure safety cage concept called MonoCage, a development of the MonoCell. All the P1's body panels are carbon fibre composite to reduce weight. In October, Ferrari unveiled a carbon composite chassis for its first hybrid car, a limited-edition model scheduled for launch "in the near future." The chassis is hand-laminated and autoclave cured. The dynamic automotive composites sector is continuing to attract investment from materials suppliers and vehicle ­manufacturers alike. This year we’ve seen aerospace materials specialists Cytec and TenCate setting their sights on the automotive automotive market. Chemicals giant BASF, already a big supplier of plastics to the automotive industry, is putting an increased focus on composites. The carbon fibre makers have also been active. Teijin is continuing to develop its thermoplastics process, while SGL, a key partner in BMW’s com­posites efforts, is also investigating thermoplastics in partnership with BASF. Dow, a new entry to the carbon fibre market, has secured a partnership with Ford. As can be seen from the developments listed here, a variety of materials and processes are being researched. According to our recent survey on the Reinforced Plastics LinkedIn Group thermoplastic composites are the most promising materials (see chart top right). You can review all the comments, and join the debate, on the Reinforced Plastics LinkedIn Group.